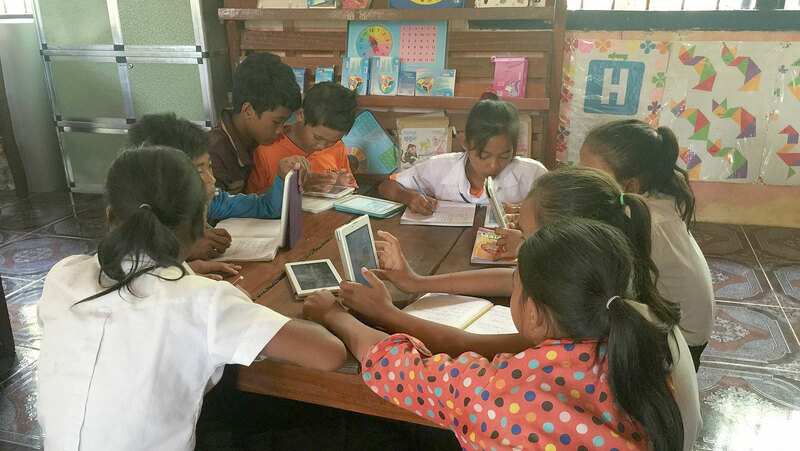 The goal of the Children’s Digital Library (CDL) project is to increase children’s access to quality reading material through the use of electronic tablets and eBook app. The project has compiled a collection of frequently used digital holdings in well-maintained and organized traditional libraries. Book publishers and developers are encouraged to increase the use of digital libraries as a a distribution channel so that a large number of Khmer language texts will become available in electronic format. This initiative is being promoted with Ministry counterparts and donors so that future expansion can occur. KAPE is undertaking this project in several of its target schools to advance the agency’s plan to introduce mobile learning modalities into its portfolio. The Minister of Education has endorsed this approach and KAPE is working with the Ministry and donors who have voiced support for the introduction of digitized learning modalities in jointly supported schools, particularly where these complement already existing activities that involve M-learning. Students in Grades 4 and 6 in three primary schools are the beneficiaries of this project. Train school directors, librarians, literacy coaches, teachers of Grade 4-6 about how to use Let’s Read app. Promote reading activities including reading clubs, bi-monthly reading competition, national reading day, reading structure for one hour per week. Provide e-Books and library (Let’s Read including Khmer and English) apps to target school.